Remember my Geode bath salt melts? They are so simple and easy to make and the result is just phenomenal! Ever since the day I made these I’ve wanted to take them to the next level. That’s why I present to you: my DIY Geode BATH BOMBS! These beauties are half bath salt melt, half bath bomb. The silver/gold bottom makes the bath fizzies look just like real rocks and the gold makes them look out of this world! Update: I’ve been seeing a lot of video and other tutorials pop up on the web that look pretty similar to my recipe. I guess I should consider it an honor that people are duping me 🙂 It’s always possible that someone happens to have the same idea, but given how similar these recipes are to my video tutorial, I don’t think that’s the case for most of these. Anyways, it’s always polite to give proper credit to a fellow blogger. That said, I love it when people try this recipe out and share the result with me, so make sure to tag me on Instagram @healthy.happy.ina or leave a comment! 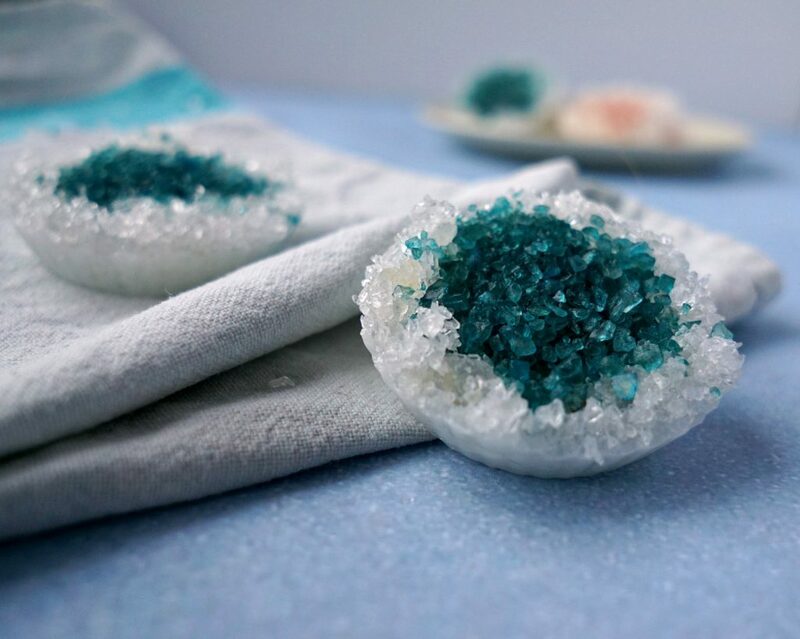 This recipe makes about 6 Geode Bath Bombs depending on the size of your molds. Combine your dry ingredients. Add 1/2 cup of baking soda, 1/4 cup of citric acid and 1/4 cup of corn starch to a bowl. Mix well. Add a few drops of essential oil if you want to give your bath bombs a nice scent. I used rose geranium essential oil and added about 6 drops. You can change the amount to your personal preferences. Next you’ll need to add your wet ingredient. Add 1/2 to 1 tablespoon of rubbing alcohol to the dry mixture. The amount of liquid you need largely depends on the humidity in the air. Carefully add small amounts of rubbing alcohol and stir to combine. If the mixture starts to fizz in the bowl you’ve added too much. Check the mixture regularly by taking a handful in the palm of your hand and squeezing it together. The mixture should clump together. At this point I’m not adding any oil yet. To add the bath salts to the bath bomb you’ll need plenty of coconut oil. Fill one half of a round bath bomb mold with the mixture. Push the mixture to the edges so the sides are higher than the middle part. The edges will look a little rough and unfinished. Give the bath bombs time to dry. I let them set in their molds. Once they have hardened they should fall right out of their mold. Now it’s time to add the bath salt melt geode part. Put 3 tbsp. of bath salts in a bowl. I used a combination of Epsom salt, dead sea salt and coarse sea salt, but you can use just one kind or mix your own favorites. I’ve noticed that dead sea salt doesn’t absorb coloring as well as other salts, but Epsom salt or sea salt works great! Scoop out about 1/3 of the bath salts in a separate bowl. Add a drop of food or soap coloring of your choice and stir well to combine. Make sure all of the coloring is distributed evenly over the bath salts. I made 1 batch with a drop of blue soap coloring and 1 with red soap coloring, which turned out a pretty pastel pink color. You can also use pink himalayan salt in the middle if you don’t have coloring or don’t want to use it to keep it all natural. Set aside to let the salts soak up all the dye. Melt the coconut oil in a microwave or double boiler. The oil should be completely melted but not piping hot. Back to the bath salts. Scoop about 1 teaspoon of the regular salts on top of each bath bomb. Distribute evenly so the top of the bath bomb is covered with bath salts. Next scoop about 1/2 teaspoon of the colored salts in the middle. The desired effect should be that the outside of the geode looks white/transparent and the inside looks colored. To make the bath salts stick we are going to use the coconut oil. Drizzle no more than 1/2 teaspoon of coconut oil over the bath salts on each bath bomb. Each drop of coconut oil will secure the bath salts in place. Use as little coconut oil as possible, because the more oil you add the less the bath bomb will fizz. Set aside to let the coconut oil solidify. Put them in the fridge to speed up the process. Once it has the bath salts should stick to the bath bomb. Note: this only works if coconut oil is solid at room temperature where you live. If it won’t solidify properly try adding Shea butter to the coconut oil before you melt it. Now your bath bomb is starting to look like a geode it’s time for the finishing touch. I added some silver and gold edible glitter dust to the outside of the bath bomb to make it look even more like a rock. To paint your bath bombs mix a pinch of edible glitter with a drop of rubbing alcohol. It takes some time to paint each and every bath bomb from top to bottom so you can choose to skip this step or only paint the top outer rim of the geode bath bomb. Dip a fine paint brush in the glitter “paint” and paint the sides with even strokes. Give the paint some time to dry and they are ready to be packaged as a gift or used all by yourself! 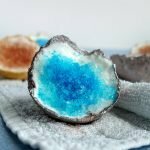 I’ve also made a quick video tutorial of these DIY Geode Bath Bombs, so it’s easier for you to follow along with this recipe. This version is the old recipe where I used a lot more coconut oil to keep the epsom salt in place. It makes the bombs a little heavier, and some of you commented that it didn’t give the fizz you’d want or expect. 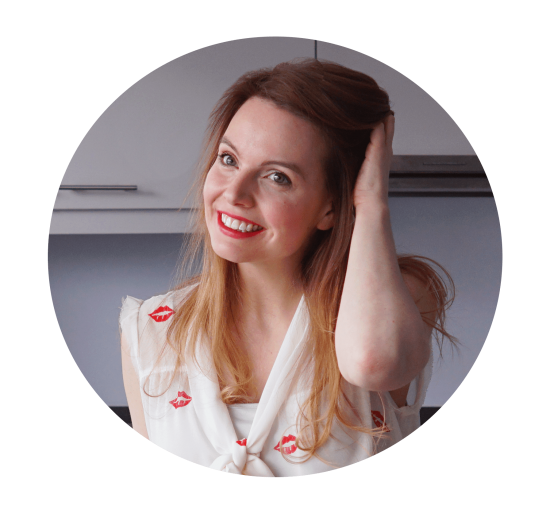 That’s why I adapted the recipe, as I found you actually don’t need to use that much coconut oil. where did you get the edible glitter dust? I bought some from Wilton but it doesn’t mix into the alcohol so it ends up leaving clumps on the outside of my bath bombs. I just ordered some on Amazon. You can more than likely buy them at a cake speciality store. Definitely on Amazon though. If you have Amazon Prime, you will receive them within two days. How can i search for the molds??? For the life of me I can’t find them. Thanks so much ! Amazon has them. You can find them with crafts or the plastic ones in Christmas Balls. (Take apart plastic Christmas Balls). If you have Amazon Prime, you will receive them within two days. What are the molds? Thanks! As a mold I used one side of a plastic Christmas ornament … they make THE BEST bath bomb molds. You can find them here on Amazon for example. This was terrible waste of my time and my supplies did not work at all! Hi Katharine, can you tell me what exactly went wrong? Maybe I can help. About how long did they need to sit in the molds before they are dry? I like to let them sit overnight, just to be sure. They are pretty!! I have left out the alcohol and corn starch….have any idea how I can remake my bombs??? I’m on a grain-free eating plan. Since our skin absorbs everything we come into contact with, does tapioca flour/starch work in place of corn starch? Thanks for posting these! All the ladies in my family will adore these for Christmas this year! These are beautiful. Does the food coloring not stain your skin? My sister in law LOVES bath bombs and these are so pretty! Are they extremely hard to do? I’m good at following instructions, but is there more of a technique that has to be there along with the instructions? If that makes any sense lol! I just don’t want to count on making these for her Christmas present and then I’m not able to do them correctly and have no time to get her something else! 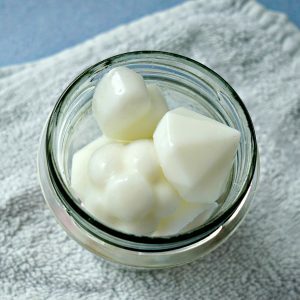 Hey is there an alternative to coconut oil, if so what is it? That could work! Thanks for the tip Dee Cee! These are beautiful. I tried them and they got completely stuck in the molds. I waited 2 days to try and unmold them- no luck. I washed out the stuff from one of the plastic molds and it was completely etched. I must have done something wrong, even though I thought I followed the directions. Any suggestions? I am going to try again and do half with out pressing as hard into the molds and the other part using plastic wrap to line the molds before filling. Hi Anita, my guess is they were a little too wet and started to fizz and the reaction caused the mixture to adhere to the mold. Don’t let that discourage you! If you notice they fall out of there mold easily you can also take them out and set them aside to dry. Thanks, I tried again with plastic wrap in the molds- no problem getting them out that way. I was careful with my liquid amount too. I just need to fancy the outside a little with the painted glitter. Too cool! thanks for the great project!! That’s great news! Thanks for sharing! After you make the bath bomb in the mold when you transform it into a geode do you use another mold for that or do you just form it on the outside freehand? Hey there im just curious if you have to use them right away or can they be stored and used later? Hi Darby, you can definitely store them and use them later! This is looks so cool! Do you make specific recommendations for scent? I am a newbie to essential oils and so am lost beyond the typical lavendar, etc. Any suggestions would be great. Thanks! Hi, I’ve started to make these bombs but when it comes to testing them out, half of the salt from the geode falls out… I’m doing exactly what the recipe says with the coconut oil and it does work for some of the salt. How can I ensure ALL of the salts stick? Hi, when I popped my bath bombs out of the mold all the salts came off in one chunk, and then the bombs began crumbling. I thought I did very well with following the directions and I let them set in the freezer overnight. Help! Thanks! Otherwise, great tutorial and beautiful idea! Still wondering if you use food coloring why it does not stain your skin? Is it because of the oils added to the geode? 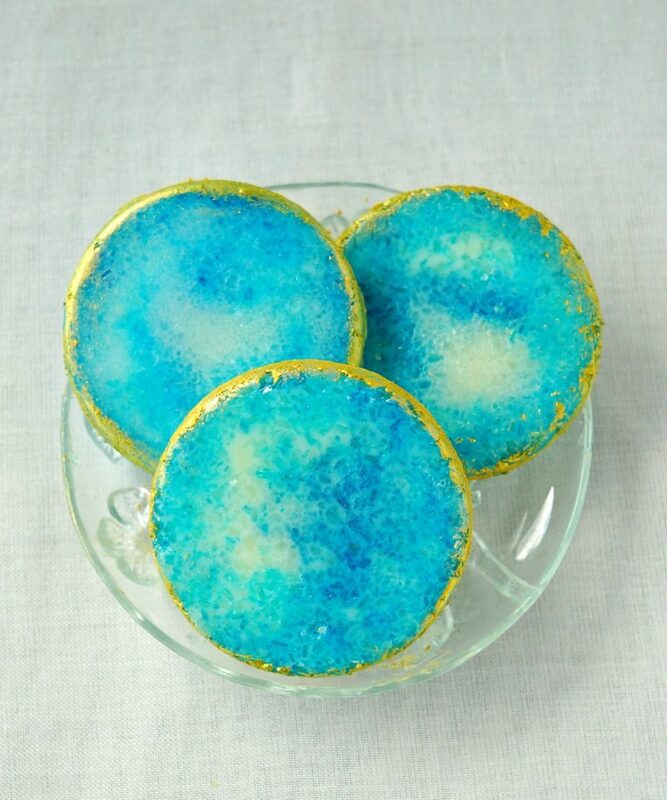 The link for the edible glitter doesn’t work =( Can you share what the brand is so that I can try and find it? Thank you so much for letting me know Paige! I updated the link. I use this brand called ‘Rainbow Dust’ with great success. You can also use mica if you want! I’m a first timer with making bath bombs. I did follow the instructions to a T but mine are a bit crumbly and I am wondering if you have any insight on how to help avoid this in the future? Thank you! It looks beautiful. Like this DIY tutorial. Hi! I tried two different recipes: yours and one from another webpage. I haven’t settled on one recipe as being superior. Both had problems. Yours made bath bombs that held together really nice. They weren’t crumbly or fragile. But they were literally GLUED into the forms. My forms are aluminum forms. Tapping them to try to get them out, the bath salts popped out of every single one, and I gave up trying to get the bath bombs out, so I threw them all into a bowl of water and let them dissolve. Also, they smelled strongly of rubbing alcohol, which definitely defeats the purpose of a scented bath bomb. I don’t know if anyone else has run into this issue. I’d love to lean toward using this recipe, but just getting them out of the forms was too destructive. Any helpful hints? Hi, I’m glad you reached out so we can figure out what went wrong together! To take them out of their molds: take the bath bombs halves out of their molds before doing the bath salts step. And try using less liquid. If they start to fizz (even very lightly) in the mold, they might stick to the aluminum. For the rubbing alcohol: they add a scent to rubbing alcohol to discourage you from drinking it (as it’s a cheap form of alcohol). I’ve never found it to be overpowering in the recipe, but depending on the brand it might be a stronger scent. You can easily swap it for witch hazel in this recipe! Proficiat met Uw mooi initiatief Ina. Mooie video, en gratis technologie op het internet! Made these as gift but slightly changed some amounts and added some of my own touches. They were very well received!!! I made sure to give all props and homage to you and to this page. Just wanted to say thank you for the fabulous instruction!! Thanks Kasie for sharing! I’m really happy to hear they liked them! hiya Ina! i tried your recipe and thanks loads for all your tips. i live in a crazy humid place and was super worried about how i was gonna make sure the crystals would stick to my bombs! but you know what? the shea butter did the trick! i started off with a super thick mix and painted onto the surface of the bomb – which was a neat trick i got from Desert Cloud Soapworks. then for the final layer, i diluted with a bit of coconut oil. they look great and all that effort was worth it to see the final magnificent geode bath bomb.